Prepare for the bombshell. Gallup surveyors tallied their numbers and found that frozen New England, my home since I was 15, is fit for fire and brimstone. Sample the map below. Most of America is colored in green shades, signaling slightly low to high church attendance. My fair region looks like fungus with no chlorophyll. It fits squarely under the ministerial label, “abysmal.” Neighbors sleep late on Sundays before their 18-hole “exercise” and brand me a “cult leader” because I preach before Baptist fanatics. This is not news. Religious officials respectfully refer to the six New England states as a “pastoral graveyard.” We’re a “spiritual dead zone,” an “epicenter of modern paganism,” a hotbed of “postmodernism” and “secular humanism.” I’m prey to a thunderous rate of piteous looks at clergy gatherings, with some colleagues proposing sabbaticals to Vladivostok as relief. If anything, Gallup was optimistic. Its pollsters say 17 percent of all Vermonters report that they go to church; other studies, using different measuring tools, drop that number to about four percent. They say a quarter of all Connecticut residents claim they’re in the pews. Trim that to 14 percent. There’s more to the survey than meets the eye, of course. Utah dwellers tumble over themselves in a headlong Sunday rush. Impressive? Not really. Many attend the Church of Jesus Christ of Latter-Day Saints (Mormons), which no other denomination recognizes as orthodox. 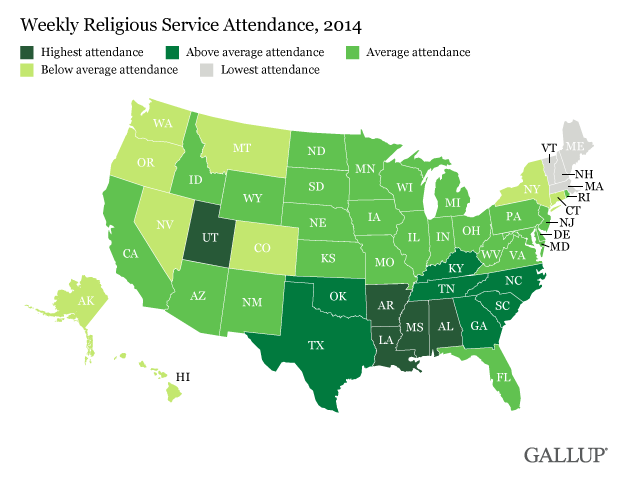 The South is solid green, which is no surprise, but one wonders: Are the faithful hearing Jesus’s teaching or civil religion’s god-guts-‘n-guns Gospel? I’ll tip my hat to the many sincere Southern Christians and acknowledge that Mormons are often upstanding, salt-of-the-Earth people who bless us with rafts of hard-working CEO’s and senators; but I still hesitate before equating “high church attendance” with “more Christian.” I’m not sure if Jesus is impressed with a packed-out house basted in the Health-and-Wealth Gospel. Nevertheless, I’ll file away this map for the future. Clearly, New England is different. It really is a mission field and church leaders should understand that. Much is lost if they don’t: I once belonged to a denomination headquartered in America’s Church Growth capital, the Los Angeles area. The number-crunching leaders saw our low attendance figures, concluded that we pastors were all lazy, and dispatched an alpha male to shake us up. We tried telling him: “New England is not like California.” He wouldn’t hear it. He knew all about “leadership” because he was writing a doctoral thesis on “leadership” and all we needed was “leadership” — and we’d better yield to his “leadership” if we wanted our jobs. He would slap us into church growth. He rattled cages all over the place. Nothing changed and, after a few months, he drove back to California. No doubt he shouted “leadership” as he watched New England recede in his rear-view mirror.